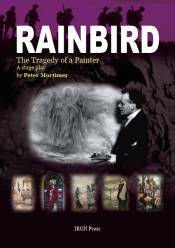 The text of a new Peter Mortimer play about the North Shields painter Victor Noble Rainbird, which was performed by Cloud Nine Theatre Company for a week in April (16th - 23rd) 2018 at The Exchange, North Shields, is published by IRON Press to coincide with the production. Rainbird led a tragic life. His highly promising career as an artist saw him accepted as the only northern painter in the Royal Academy 1911 influx where he won several awards. But Rainbird's experiences in the First World War (shell shock, gas poisoning) left their mark. He slid into alcoholism and poverty, reduced to selling his paintings for liquor in the Shields hostelries. For 80 years he was buried in a pauper's grave in Preston Cemetery, North Shields, and only recently has his reputation been salvaged. The book contains a foreword by the author, director's notes on the production, rehearsal photos and details on educational work around the production.